Bamboo palm (Chamaedorea erumpens) makes a beautiful indoor houseplant with its long, drooping jade-green leaves that grow on cane-like stems. It is a graceful plant that can grow up to 6 feet tall and add elegance to any room. It is native to Mexico and Central South America. 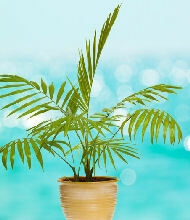 This tropical palm is very popular with decorators. It thrives indoors in low light and adds an instant attraction to the decor. You can often find them in hotel lobbies, office buildings and shopping malls. You can get that special decorative touch just by setting the potted bamboo palm plant into a wicker basket for a tropical look. If you want a more formal look, place the plant in a cachepot. This plant is a natural defense tool against indoor air pollution. It improves the air quality by filtering the indoor air of toxins such as nitrogen oxide and formaldehyde. VOCs cannot be avoided because they are found in such a wide variety of the products in our indoor environment; however, you can take steps to make your air healthier by having this plant in your home. Place one large plant or two smaller plants (4 to 5 inch pots) in a 100 sq ft room to remove toxins from the air. life-sustaining oxygen into the air to make breathing easier. Light: Low to medium (near a bright window). Humidity: The plant likes humid environment. Mist daily or place on humidity tray. A room humidifier will work well for this plant. Fertilizer: Fertilize during the growing season with a granular, time-release fertilizer. Pruning: When you see leaves start to turn yellow or brown and wilt, use pruning shears to remove these leaves at the base. The bamboo palm is exotic and attractive to have indoors and will even produce tiny sprays of flowers when it reaches maturity.